I defy you to have EVER seen someone look quite so thrilled to have an envelope on their head. This photograph is proof that children are stupid and that I win. Which rhymes with gin. There is nothing second class about this picture! Haha great picture! What rhymes with wine…? I love this photo what a great take! 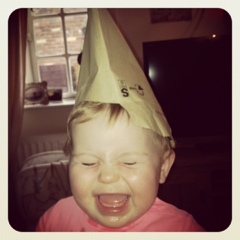 Fab picture – who needs expensive toys – envelopes and a cardboard boxes are just as fun ! Best photo I've seen all week!